I’m late to write about meeting neuroscientist and rock & roll musician, Joseph LeDoux. I was so star struck! I’ve been reading Synaptic Self and realized he would be speaking at Harvard Book Store while on the book tour for Anxious. He was lovely and fascinating and a fellow Louisianan! I furiously took notes and have attempted to share them here as best I understood his presentation. It’s not the bear cause one to feel fear. It’s running that causes one to feel fear. 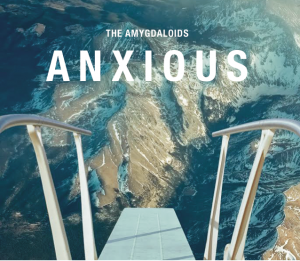 In Anxious, LeDoux asserts our culture hasn’t an accurate semantic network to process what we insufficiently label a complex internal process that we experience as “fear.” The word “fear” only describes consciousness. The human brain has two systems: (A) non-conscious fear, AKA “implicit systems” which are not fear systems, and (B) conscious fear. Only the human species has capacity for language to categorize fear in a sophisticated and nuanced vocabulary. Syntax is the split second understanding of language, behavior, and environment in a social situation. Human cognitive architecture allows for language processing. The brain hormones detect threat or tension and respond with stress hormones. The purpose of these chemicals is “persistence” in the face of a threat, to pay attention to the stimulus, the danger. The body must have systems to distinguish danger from other chemicals. Another way to say this is that: there is a stimulus, then our brain then has a series of detection systems which collapse into one concept as the brain processes these stimuli. Stress is subliminal. Amygdala gives rise to brain arousal. This almond shaped cluster gets activated but is not responsible for fear and threats. Beyond the visual cortex. there are circuits that are necessary to stages of processing that attend to information about a stimulus. At some point, the stimulus must go to the prefrontal cortex for people to attend to that information. Brain is a product of environment. Consciousness helps us understand as we go through life. Emotions are felt, so they are conscious, yet emotions are generated unconsciously. The involved cortex has got to be in the conscious mind in order to cause feeling. LeDoux gave the example that SSRI medication act on the “under the hood systems” but not the systems that give rise to feelings, emotions. LeDoux describes emotions as analogous to bricolage, the art making process of using materials that happen to be available. Schema are stored in the brain about past experiences, emotions are available compilations of these past experiences. Ultimately, fear is the representation of “you,” the “I” in the brain. A person can only feel fear if they have self concept. While humans have inherited primal systems, we have the human brain with the ability to process and create a feeling, communicating mind. It was really a wonderful talk. I definitely recommend reading his work! *Blog post image from CD (Cover art by Colin Webber at Viking & CD Design by Amanda Thorpe).